It’s times like this that I feel quite sorry for Aucklanders. Not only are they having the mutha of all political conglomerations shoved down their necks without so much as a by-your-leave, and not only are they being stung with governance by 7 quangos over which they will have no control, and not only do they have an incoherent waterfront and no sign of fixing it, and not only do they have the prospect of John Banks lording it over them yet again, but they also have the prospect of Pods invading their space. Yes, I know that we’re all in Wellington (or Wellywood, or Wetaville, or Your Name Here Wood – did we tell you that we were the first ones to break that story – back in November? Did we? Did we? Did we?) and the Jafas are up in Dorkland, so really we shouldn’t have to worry about them, but honestly, I do worry, sometimes. I mean – it’s not that hard to get a city going right, and especially with one in such a beautiful setting as Auckland – how could they get it all so wrong? There’s nothing wrong with the prospect of a super city, but to do it with a Royal Inquiry and then change the recommendations within a week just reeks of corruption. The poison yellow dwarf can take a bow for that. What’s the point of democracy and due process if Rodney Hide just ignores the lot? To get Auckland governed with 7 quangos is silly as well, but to permit them to run with no public input is just lunacy and asking for trouble. Why aren’t they marching in the streets up there yet? In typical Auckland fashion they are blaming it on “Wellington” – good grief! Rodney Hide is not “Wellington” at all – he’s pure Evil ACT, which is about as “Auckland” as you can get. And the debacle over the nasty stoush on the waterfront shows no sign of abating just yet. Want to know why the architectural profession showed no backbone when Mike Lee and John Banks were hacking down the architects designs? 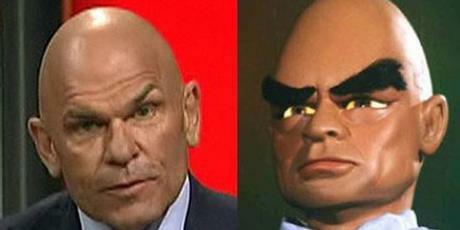 Having a leader of the NZIA as one of the contenders, hamstrung by ‘conflicts of interest’ didn’t help much now, did it? Where was the voice of the architectural profession when they needed it? What a PR disaster, for Auckland, and for Architects, but most of all for Auckland Architecture. But the biggest laugh of all came last night on Campbell Live, where he interviewed a very friendly german guy working for Massey Design School in Auckland, with a wildly mis-guided proposal for ‘Slim Ride’ Pods to solve Auckland’s traffic woes. Oh no. Mr Neuland came up with the design after doing field research on the city’s often-maligned bus and train system. Many people shunned public transport because of its bad image, considering it unreliable, confusing and risky, he says. “The confusing patchwork of individual bus lanes sharing the congested road corridors does not help make public transport more inviting,” he says in a report on his design, recently published in the journal of the Railway Interiors Expo in November in Cologne, where he presented his concept. Every time the traffic gets tough, the Pods get going. 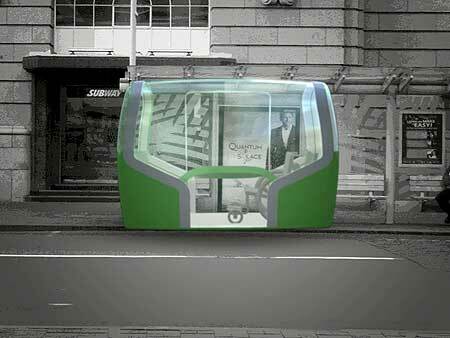 A few years ago in Wellington, there was a wild raving Pod Caster here, promising to solve the city’s public transport problems with a proposal to run Personal Automated Transit devices through Wellington. If I recall correctly, there was a raging argument going on at the WellUrban website (yes, I know, we miss it too…) between the Pro-Podders and the Anti-Christ-Pods. And most amusing it all was too, for someone on the outside. Now, this time, someone (one Olly Neuland?) 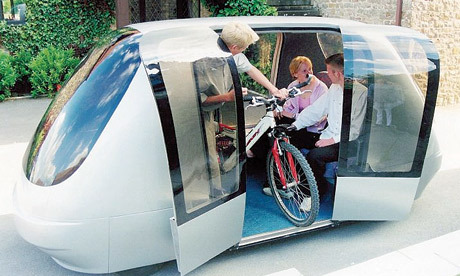 has reinvented the – well, wheel, or wheeled vehicle, by proposing the Pods as an example of sensible commuting. Really, this whole business with the giant sign gets me going. As tacky as it is, and as silly an idea as it is, and while there has been over 2000 alternative sign ideas generated in the last 48 hours, the news that ‘American lawyers’ say that we shouldn’t do it gives me a sudden urge to take it very seriously and do it anyway. Copyright protection? Do they really think that someone flying into Wellington might actually be confused and really think they were in Los Angeles, just because they saw a parody of a sign? Oh please! Get over it, you bunch of prats! Copyright lawyers seem to occupy some random parallel universe of stupidity and unpracticality, unconnected with the real world. I can understand copyright protection where Chinese plastic widget makers are ripping off the creator of some carefully crafted product with lots of IQ, but this is a whole different kettle of fish (terrible habit, by the way. Fish do NOT like to be in a kettle, and besides, your kettle will never be quite the same again afterwards…). Lyle Lanley: What’s it called? Lyle Lanley: That’s right! Monorail! If you happen upon anybody in charge down there, can you let them know we’ve got enough motorways up here now. Roger apl, will do. Actually, i don’t think that is controlled by Wellington – its an AKL thing. 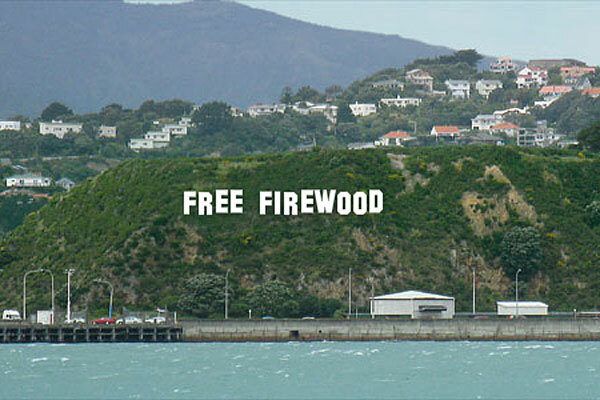 Look for the ‘Off’ button – probably under one of those random volcanic cones you have…..
After the Wellywood sign is erected, we should also have a faux Eiffel Tower and a Statue of Liberty, both of which will be a clever satire of their northern hemisphere counterparts. We should not erect an original structure, like Auckland did with the Sky Tower, because that would be a bit boring and not a parody. you don’t think that the Sky Tower was itself a parody? It’s a copy of the 32 or so Sky Towers around the world, but mostly of course, its a pretty good copy of the Jetson’s Tower. I though it was a total lame-duck piss-take for years, until i actually went to Auckland and found to my astonishment that it had been built…. making it of course a rather more expensive parody than sticking a few sheets of corrie-iron up on a hillside.